UMES 30 Ep. 15--Dr. E. Faye Williams, Esq. 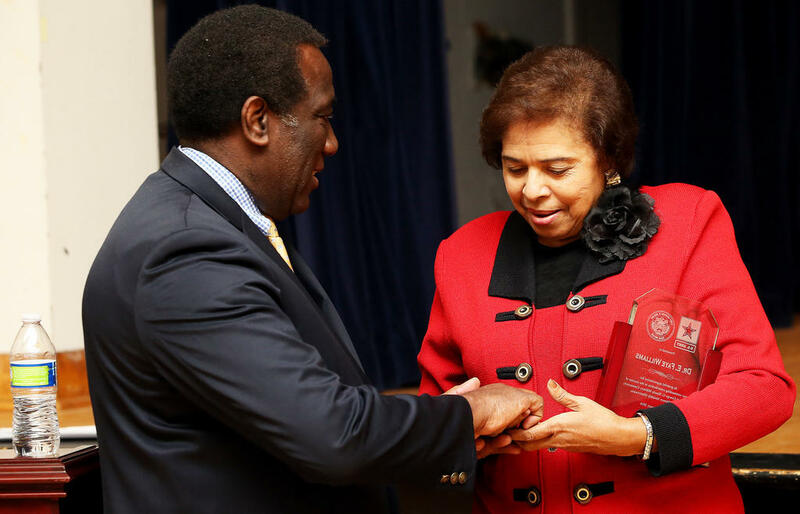 Defense Media Activity Director Mr. Ray B. Shepherd offers an award to National Chair of the National Congress of Black Women Dr. E. Faye Williams at McGill Training Center in Fort Meade, Md., during a Black History observance in 2016. WASHINGTON (AP) — President Barack Obama's re-election effort is paying close attention to two candidates mounting third-party campaigns for the presidency, believing they could draw votes from Republican rival Mitt Romney and help Obama win a few tightly contested states. One candidate is Virgil Goode, a former conservative Virginia congressman who is running as a member of the Constitution Party. The other is Gary Johnson, a former two-term Republican governor of New Mexico who is the Libertarian Party's presidential nominee. RICHMOND, Va. (AP) — Mark Herring, a two-term Democratic state senator from Loudoun, is entering next year's race for attorney general of Virginia. Herring made the announcement in an e-mail to supporters Tuesday. One state senator, Republican Mark Obenshain of Harrisonburg, has already announced his campaign for the office now held by Republican Ken Cuccinelli. So has a member of the House of Delegates, Rob Bell of Charlottesville. Cuccinelli will run for governor next year and not seek a second term. ANNAPOLIS, Md. (AP) — The Maryland Democratic Party has filed a complaint against the Maryland State Board of Elections relating to the validation process of signatures in a petition drive against the state's congressional redistricting map. BALTIMORE (AP) — Rep. Roscoe Bartlett is skipping the Republican national convention in Tampa, Fla., next month to spend time campaigning. The Baltimore Sun (http://bsun.md/Myvg3E ) reported Sunday that Bartlett's campaign manager says the 10-term incumbent is focused on earning votes in Maryland's 6th Congressional District. Bartlett faces a difficult path to re-election in November due to a reconfiguration of the state's congressional map.